Just after crossing the Colorado you will see and exit marked "Route 66/National Trails Highway". Take this exit (see map). The old road winds north along the Colorado river initially. Then it suddenly turns west and continues under I-40 before again turning north. It parallels I-40 on the right until it reaches exit 147 on I-40. Here the road agains winds west and north until it runs into US 95. The old roadbed is beneath the asphalt of US 95. If you look to the east you will see the Colorado River and Topock in Arizona. 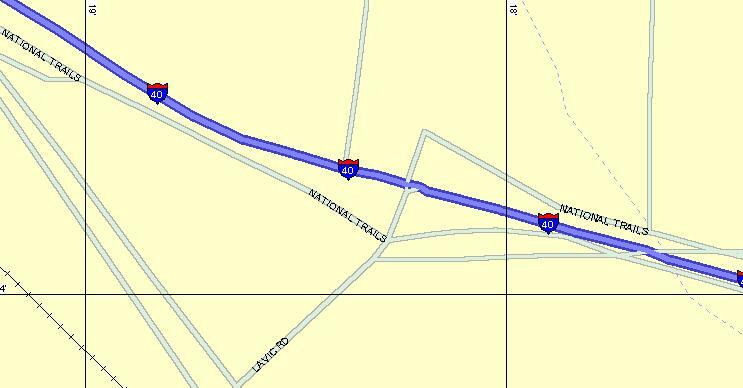 Continue on US 95 until it crosses under I-40 and becomes East Broadway Street in Needles. 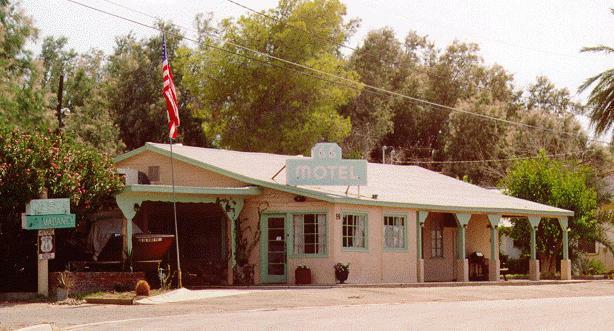 Look to your left upon entering Needles and you will see the 66 Motel, which has recently been restored. 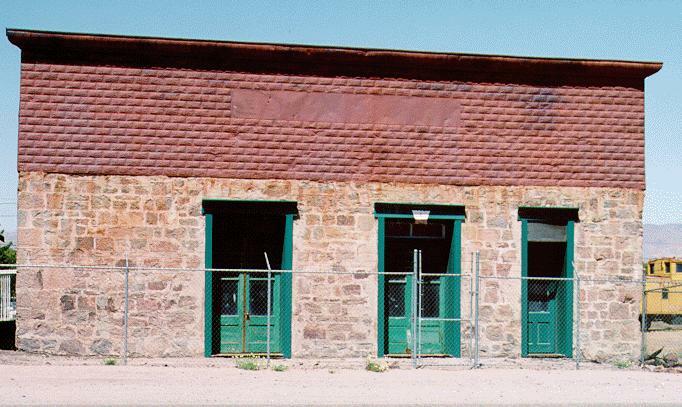 The old Fred Harvey Hotel, El Garces, is still standing in Needles next to the Santa Fe yard. I read of plans to restore the building, but the restoration was supposed to begin in 1997 and as of August 1999 there were no visible signs of a restoration project under way. Follow East Broadway as it transitions to Front Street and then West Broadway through Needles. 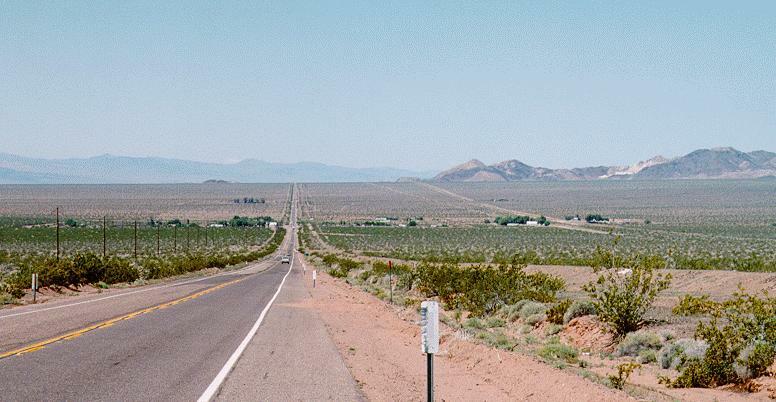 The next section of the road goes through the heart of the Mojave Desert. Daytime temperatures here can reach 120 degrees Fahrenheit. There is no shade along this stretch of the old road. The availability of fuel varies but in general is sparse, especially for 92 octane and diesel. Fill your tank in Needles. There are few repair services between here and Barstow. Cell phones work intermittently throughout this area and there are no call boxes on the old highway. There are call boxes on I-40. If your vehicle has a suspect cooling system it will fail on this stretch. Your best bet is to stay on I-40 where you can summon assistance should your vehicle break down. Do not assume that someone will stop to aid you. What traffic there is on the old road is usually locals who moved here to get away from city people and their problems. The desert can be beautiful, and it can be deadly for the unprepared. Having said that, the next stretch of the road can be one of the most interesting and intriguing. Try to imagine driving this stretch in a 1929 Ford with no air conditioning. You might want to simulate this by turning off your air conditioner and lowering the windows. Then again you might not. The desert vistas must have seemed terrifying to someone who desparately needed to get across the Mojave. Return to I-40 and take the exit for US 95. This was the pre-1931 alignment. Follow the road through Goffs. 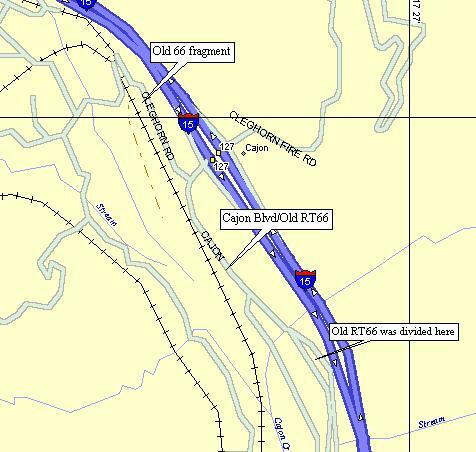 If you prefer to stay on the post-1931 alignment stay on I-40 and exit at Mountain Springs Road. This section of the National Trails Highway heads directly southwest to Essex. Goffs Road runs south, and crosses under I-40 at Fenner. The road now resumes the post-1931 alignment. The road here runs well south of I-40 and generally follows the Santa Fe Railroad roadbed. This is because the engineers of the old road tried, wherever possible, to maintain a grade of no more than 2% (same as a railroad) since cars of that era had trouble climbing steep grades. 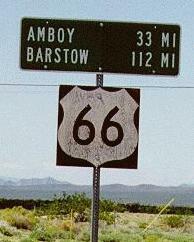 I-40 was blasted out of the the foothills of the mountains to the north taking a straighter path to Barstow. As a result the grades are steeper, but not much of a problem for cars built after 1955. The road runs right down the middle of Fenner Valley. To the north of the road are the Clipper Mountains. You will most likely see anywhere from ten to twenty Santa Fe freight trains heading east and west as you drive this section of the road. Occasionally you may see an Amtrak passenger train. 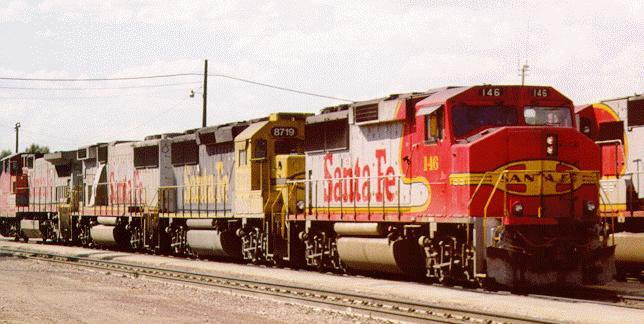 This is a very busy section of the Santa Fe railroad. When you cross the Santa Fe tracks at various places on this stretch of the highway be very careful. There are no crossing-gates and no warning lights. Stop and look both ways before you cross. There is a post office in Essex and some old buildings at the intersection of National Trails Highway (Route 66) and Essex Road. The next structures you will see are located just west of the intersection of the old road and Danby Road which goes south to Danby, a Santa Fe siding. Here you will find the remains of the Danby Store and Gas Station. There is a chain-link fence in front of it now, probably to keep roadies from trampling through the place. About 17 miles from the Essex road intersection the road climbs a hill and you will see the remains of a gas station at Cadiz Summit (referred to simply as "Summit" in some texts). The building is covered with grafiti. You can get an excellent view of the road as it descends toward the desert if you walk a few feet east of the gas station. If you walk a few feet west you will get a view of the desert to the south. As you start down the hill you can see the scattered buildings of Chambless in the distance. Off to the left is the huge Bristol Dry Lake. On your right are the Marble Mountains rising well over 3,000 feet above sea level. There are several surviving buildings in Chambless. Two of these are the Road Runner's Retreat and gas station. The Road Runner has a huge sign on the old road. 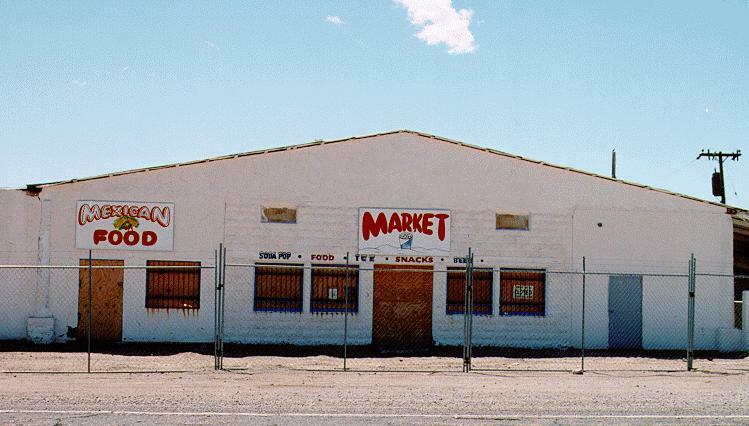 Another building is this market which is fenced-off to keep roadies out. A bit of a mystery here is the fact that the post office is named "Cadiz", but it appears to be in Chambless. Cadiz is actually a couple of miles south of here where the Santa Fe siding (named Cadiz) is located. The next "town" is Amboy. 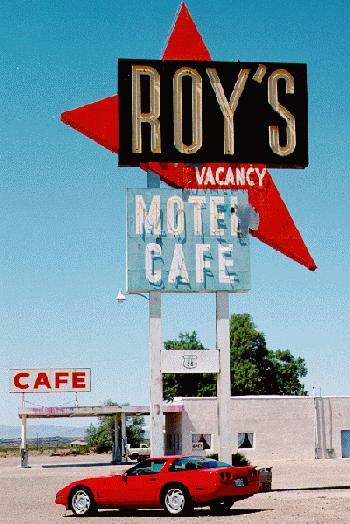 This is the site of Roy's Motel and Cafe, owned since 1938 by Buster Burris, whom you will find at the lunch counter most days. He is approachable, and will talk about the old days when the highway ran through here. Check out the pay-toilets and pay-showers in the back. The old motel where travelers used to stay is still here although it does not appear to be in use. 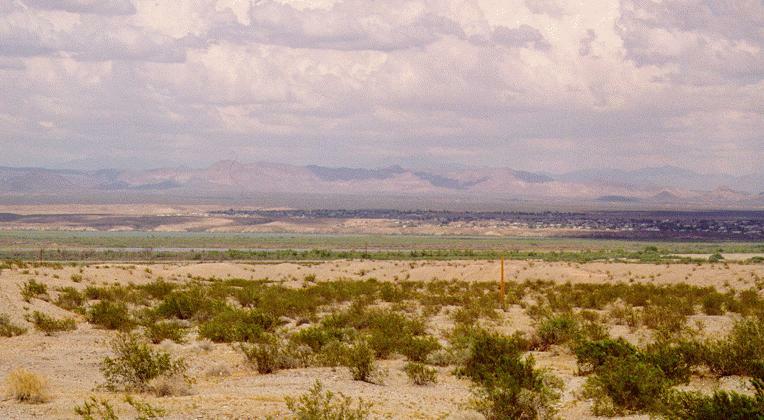 Directly across Route 66 to the south is Bristol Dry Lake. If the Santa Ana winds are blowing you will see numerous dust devils spinning the alkalai dust in choking clouds. 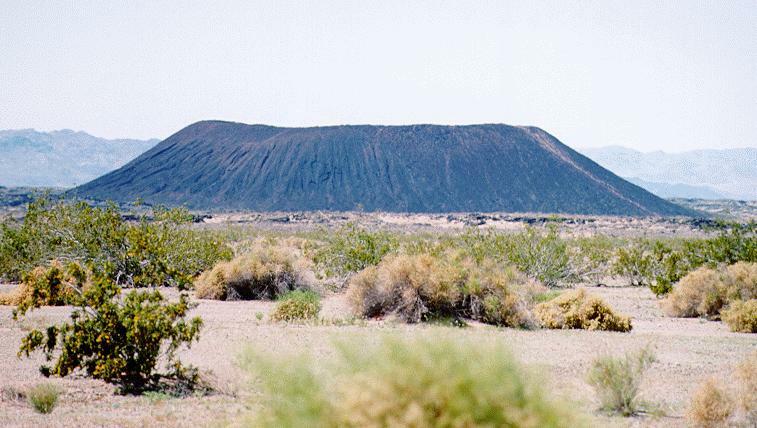 You will also see Amboy Crater, the cinder cone of an extinct volcano. 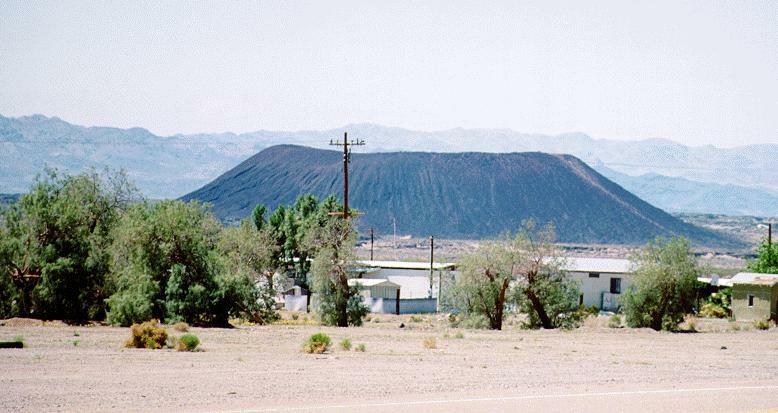 Drive a few miles west along Route 66 and you can hike out to Amboy Crater. You can see the trail worn into the cinder cone from hikers. The lava is very sharp so wear sturdy shoes and watch your step. The Bullion mountains to the south separate the Mojave Desert from the Coachella Valley and the Twenty Nine Palms/Palm Springs area. The Bristol Mountains are to the north. Bagdad is next and there is nothing left of it except a railroad siding and a solitary tree which was still alive in 1998 when I last drove this section of the road. The movie "Bagdad Cafe" was not filmed here. Bagdad, and other towns along this stretch of the old road derived their names from the names of adjacent Santa Fe sidings. After Bagdad the next such siding is called Siberia, followed by Klondike. You will probably see freight cars sitting alone out there on the sidings. Ludlow is the next town and here you will find the old Ludlow Cafe is still standing but not open for business. You must cross under I-40 again to continue on the old Route 66 asphalt on the north side of the Interstate. Make your right turn at the intersection of National Trails Highway and Crucero Road. The Ludlow Coffee Shop will be on your left. Do not continue straight as the asphalt ends a short distance from the intersection. The Cady Mountains are to the north and rise to over 3,000 feet. There was an explosion of wildflowers stretching out to the mountains from old 66 in April 1998. 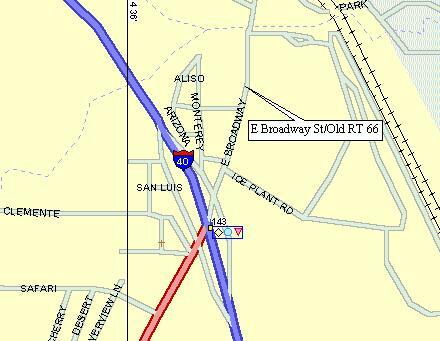 At Lavic Road you cross under I-40 again and return to the south side of the Interstate. On your left, on the south side of the road, you will see extensive black lava beds. The lava came from a volcano which left a cinder cone now called Pisgah Crater. The aptly named Pisgah Crater Road will take you to the base of the cinder cone. If you hiked out to Amboy Crater you can skip Pisgah. The highway continues west on the south side of I-40 in an almost straight line after it crosses the old lava flows just past Hector Road. On the south side of the road are the Rodman Mountains and the Newberry Mountains. The higher peaks behind the Newberry Mountains are the Ord Mountains rising to over 5,500 feet. 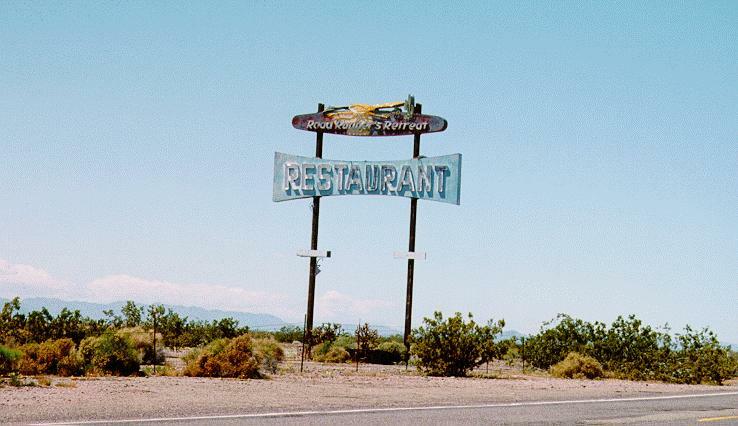 Newberry Springs is home to the Sidewinder Cafe, where the movie "Bagdad Cafe" was filmed. If you haven't seen the movie you should. 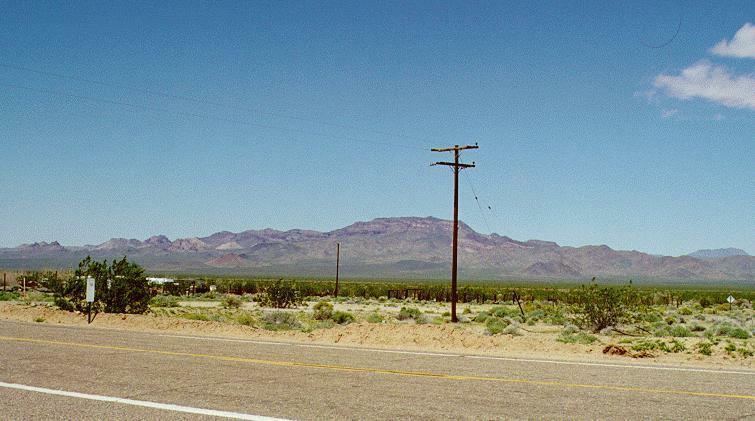 It does not have the remotest connection to Route 66 except that it was filmed at a landmark along the road. However, it is a very funny movie and it does show some of the old buildings and the road itself (with traffic on I-40 whizzing by in the background). 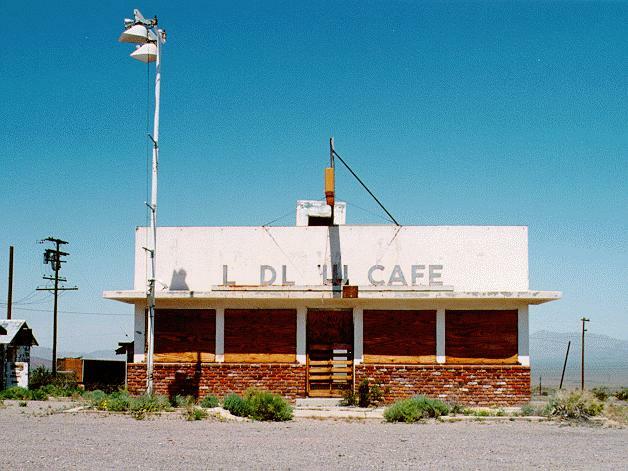 The Sidewinder Cafe has been renamed the "Bagdad Cafe", as of April 1998, probably to capitalize on the number of roadies traveling the old road. 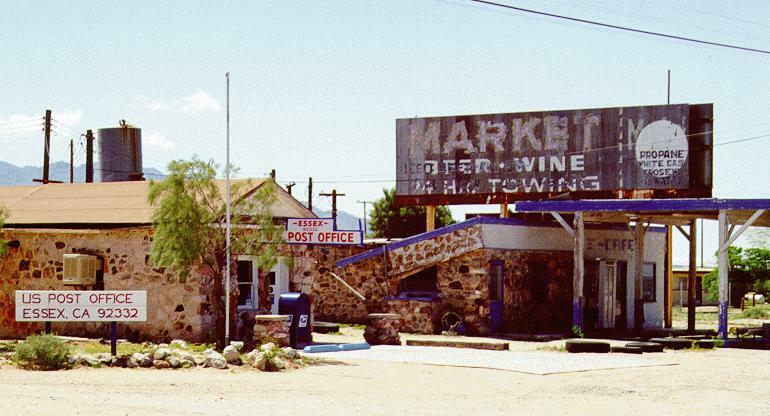 There is a surviving gas station called the Dry Creek Station about two tenths of a mile before you get to the Sidewinder Cafe. After you pass through Newberry Springs you must cross under I-40 to continue on Route 66. The road now runs along the north side of I-40. The road along this stretch has a series of dips (locals call them "whoop-dee-does") that in places reseamble a roller coaster ride. Slow down for these. 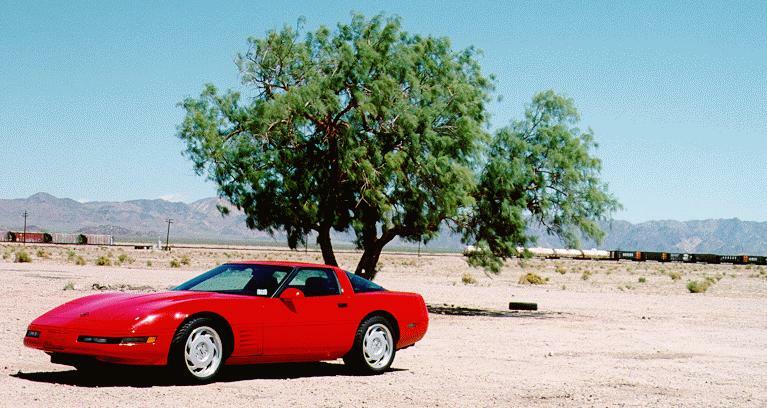 I managed to bottom-out the suspension on my Corvette (which has the stiff Z07 suspension) on one dip on this stretch because I was going way too fast in an attempt to get to San Bernardino while the sun was still high enough for photography. In April 1998, after heavy El Nino rains, the desert along this stretch of the road exploded with wildflowers. Continuing west you will see on your right a tall tower that glows white at the top, surrounded by mirrors. This is the California Edison Solar One electric generation facility. There are thousands of mirrors (the white things in the photo) which are kept in alignment with the sun and the top of the tower by a computer. The reflected sunlight is used to boil a liquid which then heats water turning it into steam. The steam drives turbines connected to alternators which produce electric current. It is a very clean way to produce electric power. Daggett is the site of one of the ubitquitous Army Air Fields that sprang up in the desert during World War II. It is now the Barstow-Dagget Airport and is still used by the National Guard who fly helicopters from it. 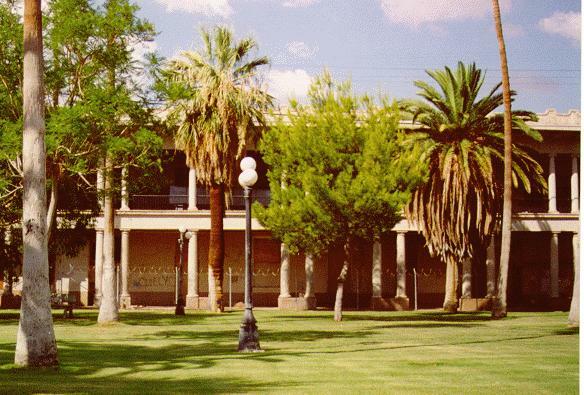 It is also home to the Stone Hotel on Santa Fe Avenue. 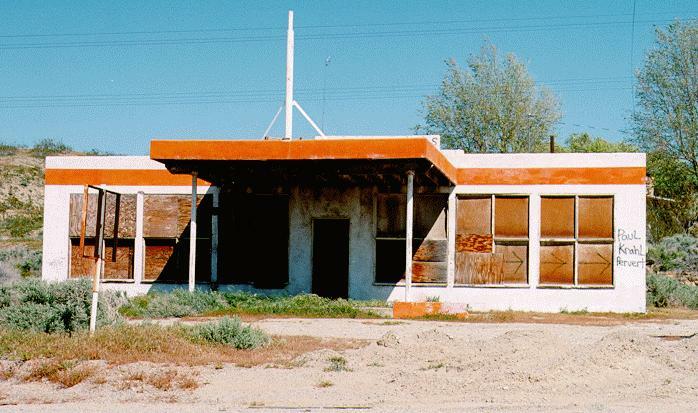 The California Inspection Station, mentioned in the Grapes of Wrath, where the Joads convinced the inspectors that grandma was ill when in fact she was dead, is now the Suburban Diesel Service. The large sheds which were built to provide shade are still standing but now shade a collection of old trucks and buses. 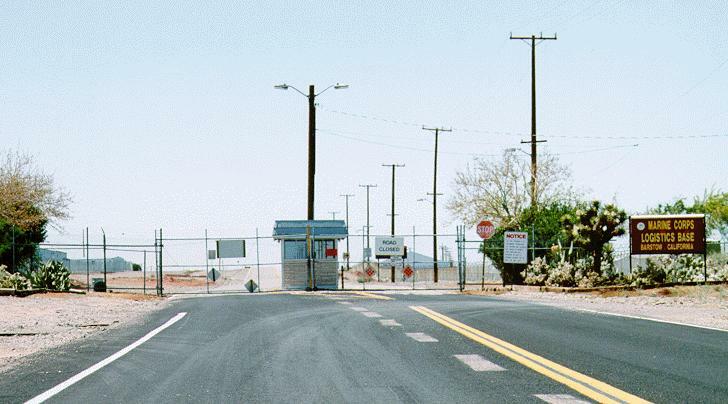 National Trails Highway runs through the Marine Logistics Base but the road is closed to the public. There is an I-40 ramp here so get back on I-40 for a short distance. 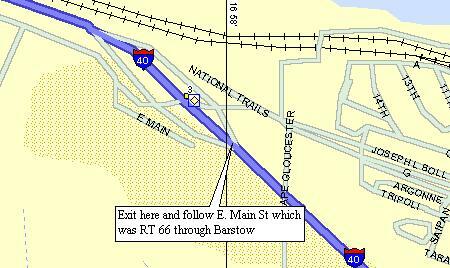 Take exit 3 from I-40 to enter Barstow on Old Route 66. This is East Main Street. At the stop sign at the bottom of the off-ramp you will make a left. If you look to your right you will see the other end of the road that comes through the Marine Logistics Base. 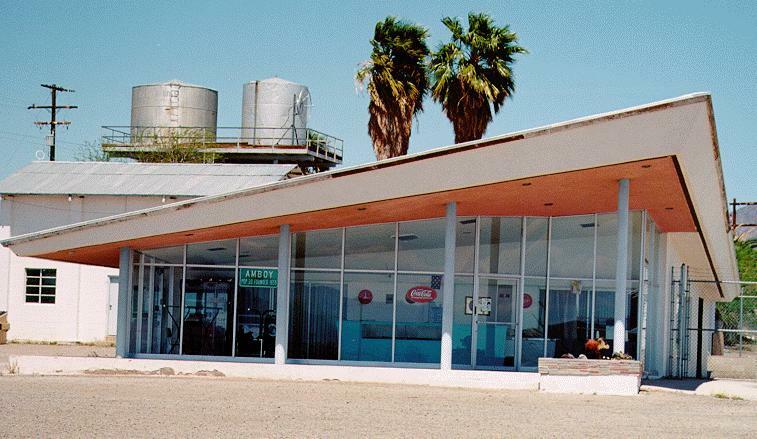 Follow Main Street through Barstow to stay on Old Route 66. 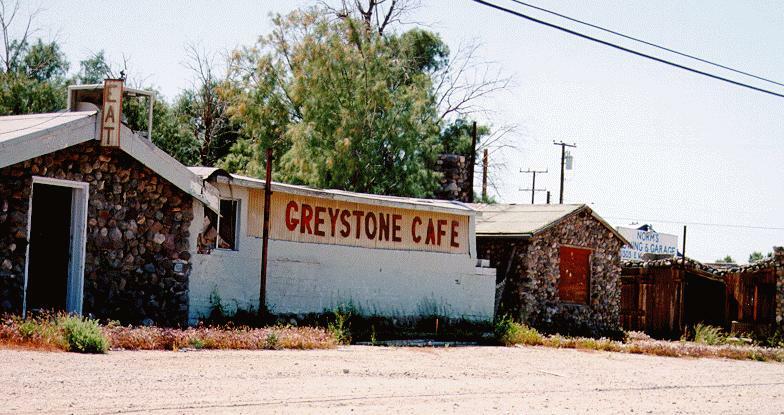 About three quarters of a mile after the left turn at the stop sign you will see the old Greystone Cafe on the left side of the road. 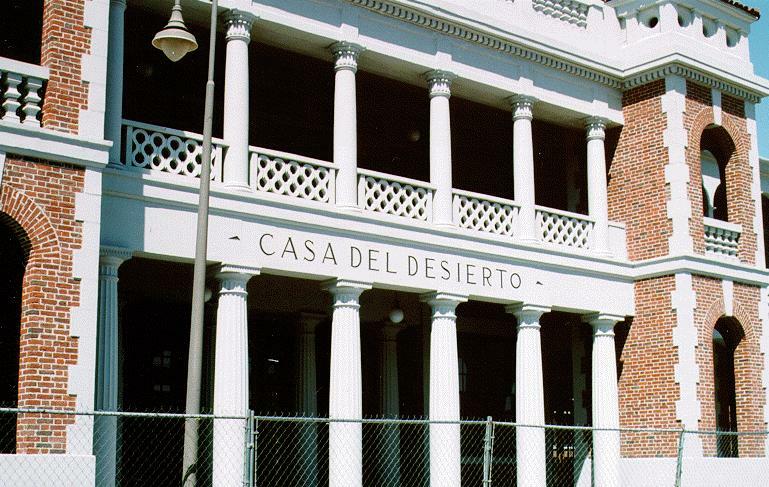 The old Casa Del Desierto Harvey House and railroad station have been rebuilt (not restored). To get to it, make a right at 1st street from East Main Street. Cross over the old iron truss bridge which spans the Santa Fe tracks (now the Burlington Northern/Santa Re Railroad) and bear to the right. 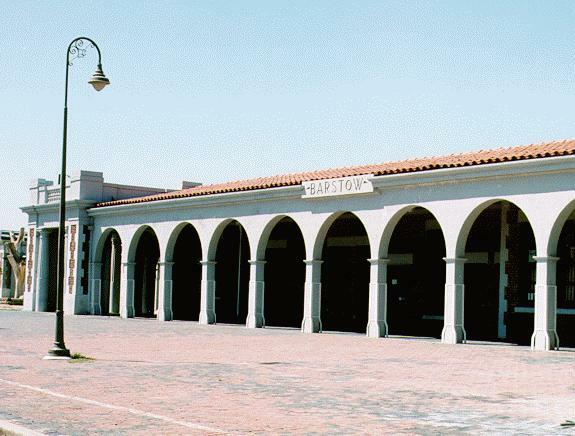 It is now an Amtrak station and it appears that the "Casa Del Desierto" is occupied by real estate offices and trendy boutiques. There does not appear to be a restaurant inside. The Santa Fe has two large facilities here. 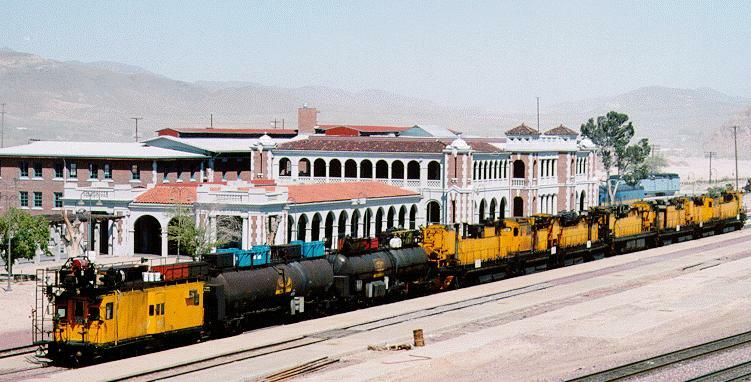 A classification yard and a diesel locomotive repair shop. There are usually about a thousand freight cars on the various sidings, being put together into trains. If you drive through the facilities you can see cars being "humped". You will also see about fifty diesel locomotives on the tracks around the repair shop. 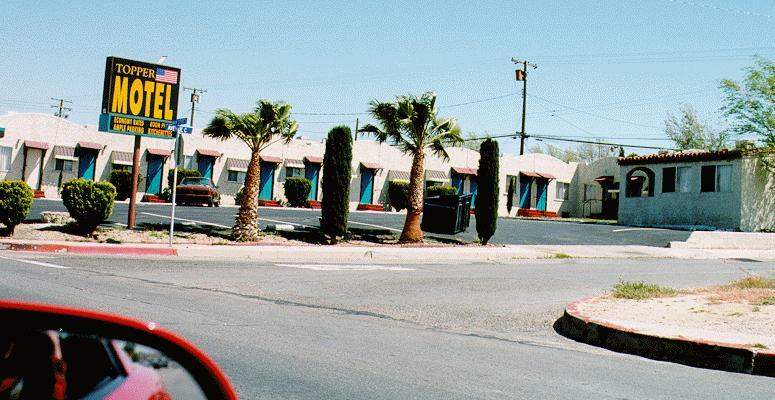 There are a number of Route 66-era motels and restaurants on West Main Street. 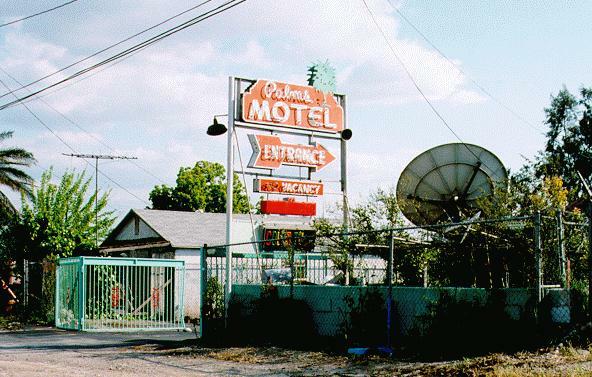 Some are still in operation as motels and restaurants, while others have been converted to other uses. For example this former motel is now a mexican restaurant. 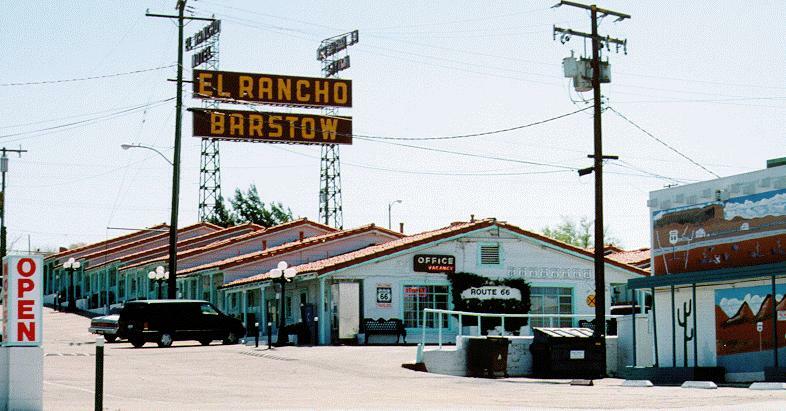 The El Rancho Motel is still in operation as is the Topper Motel. The farther you go on West Main Street the more old buildings you will see. Leave Barstow on West Main Street. This is the old Route 66 alignment. Pass through the towns of Lenwood, Hodge (nothing left), and Helendale. There are a number of old buildings along this stretch beginning at about 25 miles from Lenwood. On the left side of the road is an old gas station that appears about to be demolished. A few miles further south on the left side of the road is another old gas station. On the right side of the road is a closed down combination gas station, store, and cabins, all made from white stones. After passing over a truly cool old iron truss highway bridge, you enter Oro Grande. The name means "great gold" and here you will find the Riverside Cement Company. You will see it on the left (east) side of the road. 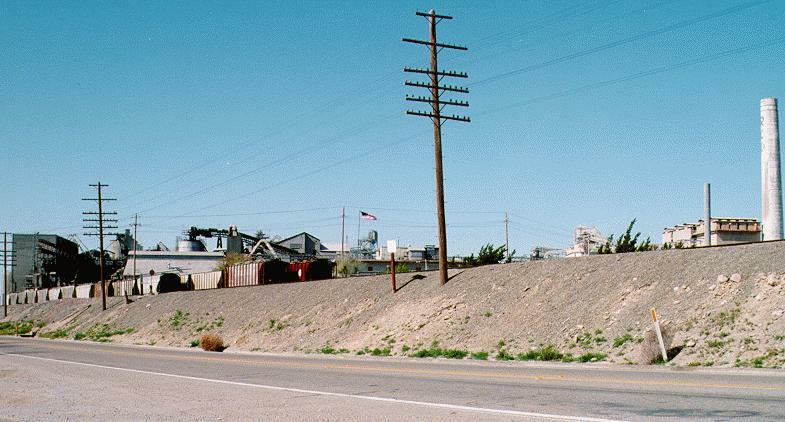 The Santa Fe railroad runs through Oro Grande on the same side of the road. 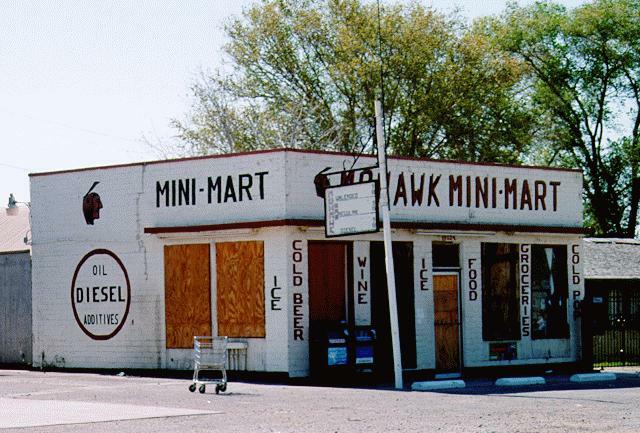 Across the street you will see the Mohawk Mini-Mart. The building is original, it was an old gas station. 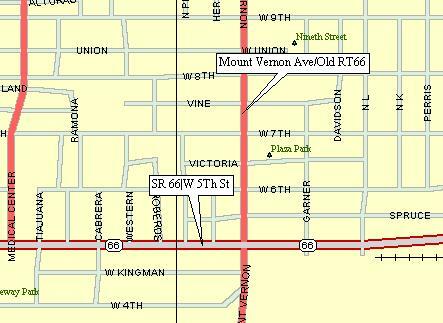 Following the old road south, you will enter Victorville, where you must rejoin I-15 at the Palmdale Road Exit. Exit I-15 at the Cleghorn Road exit. Here is a map of this stretch. This is a stretch of the old road now named Cajon Boulevard. Running parallel to I-15/I-215, Cajon Boulevard winds through a canyon beside a stream. Along this stretch the old road also parallels the Union Pacific and Atchison, Topeka, and Santa Fe railroad tracks. It is not uncommon to see long freight trains snaking their way through the canyon headed for the Cajon Pass. 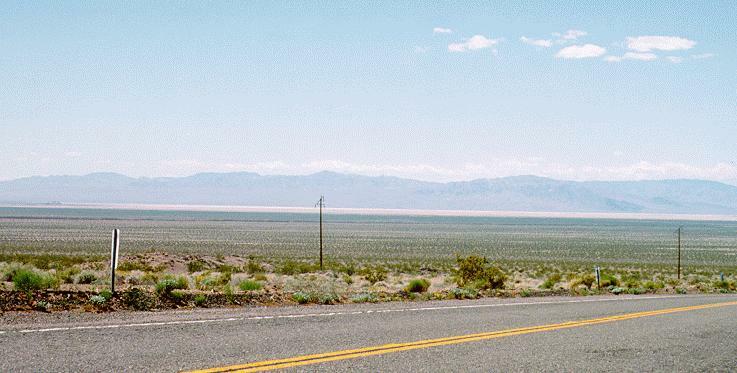 Route 66 was a four-lane divided highway along this stretch through Cajon Pass to allow for safer passing of slower traffic. The nortbound lanes are still there but have been blocked off. You can continue along here only as far as the Kenwood Road Exit of I-15. Just a few years ago you could follow the road further south to where it dead-ended at I-15. Because of mudslides and washouts as a result of El Nino rains however, the road is now closed off. Rejoin I15/I-215 at the Kenwood Avenue exit for the short drive to the Devore Road exit. Warning: the Devore Road exit is immediately after the "Y" where I-15 heads west from the right three lanes. Also, you must move to the center lane IMMEDIATELY after enetering I-15 in order to be in position to follow I-215. Take the first exit from I-215 and make a left at the stop sign at the bottom of the very short off-ramp. This is again Cajon Boulevard and the original alignment of Route 66. Take Mount Vernon Avenue south. This was Route 66 in San Bernardino. Old Route 66 architecture meets the space age at the Palms Motel which is still in business, due no doubt to that satellite dish which brings in HBO. 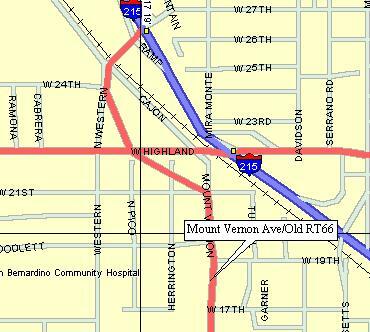 Continue south on Mount Vernon to the intersection of Mount Vernon Avenue and West 5th Street. Make a right. West 5th Street becomes Foothill Boulevard. From this point you can stay on the old road until Pasadena. Foothill Boulevard is old Route 66 and is marked as "Historic Route 66" along the route. 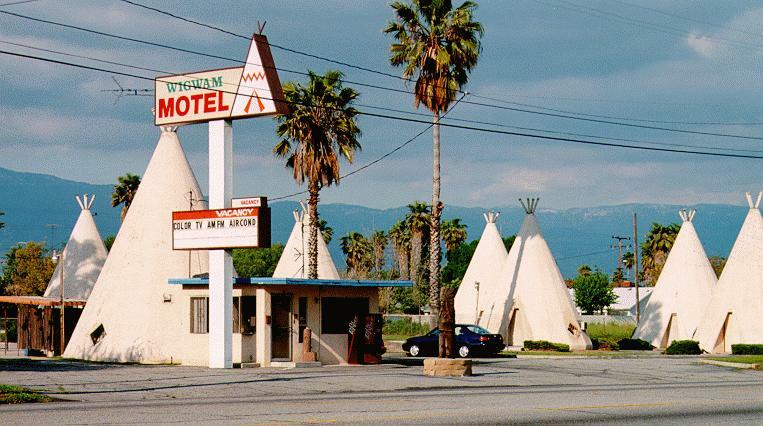 The Wigwam Motel, in the town of Rialto, is still open for business in April 1998. Foothill Boulevard continues west arrow straight towards Arcadia. The old road had several alignments along this stretch. At one point the road went through Glendora, Monrovia, and Sierra Madre. But as Loas Angeles County became more populated, the decision was made to bypass these towns in favor of a less congested route to the coast. Colorado Boulevard, the route of the annual Rose Bowl Parade, is old Route 66. You can't miss this stretch because there is a blue line painted along the route for the benefit of the parade. You will pass by the Norton Simon Museum, which is usually the backdrop for the TV coverage of the parade. They usually show the palm trees in front of the museum with the snow-covered San Gabriel mountains in the background. This causes a sudden migration of people from the upper midwest who are usually hip-deep in snow at the time. The final stretch runs along Santa Monica Boulevard all the way to the ocean and the Santa Monica Pier.